Acer negundo or the Box-Elder Maple is a rounded, deciduous tree with a stout trunk, upright and branching habit. 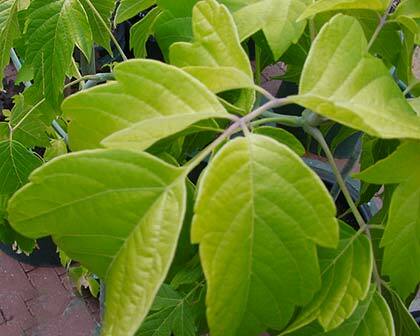 It produces attractive mid green foliage that turns to spectacular shades of golden reds and browns in autumn. The flowers are small and appear in drooping racemes in spring which then turn to twinned samaras. 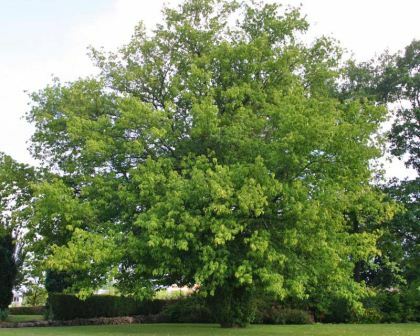 It is fast growing and makes a good shade tree though its branches can be brittle in high winds. Acer negundo is often planted to provide good shade for Azaleas or Rhododendrons, though it does not like salty winds which tend to scorch the leaves. They tend towards a short lifespan and being fully dioecious requires both a "male" and "female" tree for either to reproduce. Soil: it prefers organic material rich soil though will grow in most soil conditions. For best autumn colour grow them in a neutral or acid soil. Maintenance: It does not like full sun in warmer climates - the warmer the climate the more shade it needs. Other Species: Over 100 species in all though only nine are native to North America. Comments: Garden varieties tend to not reach the height they do in the wild - 10m is probably maximum in the domestic garden.